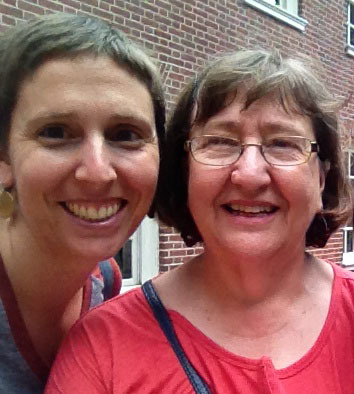 Picture with my mom taken July 14, 2013 at Independence Hall, Phillidelphia, PA.
My mom started teaching me how to knit when I was 4 years old, but most of my knitting has been over the last 20 years. Right from the beginning I started altering patterns and then making up my own patterns. In 2015, I began working with a tech editor and published one of the many patterns I developed. In late 2017, I began committing more time to working on developing patterns to publish. Pattern released February 9, 2018. 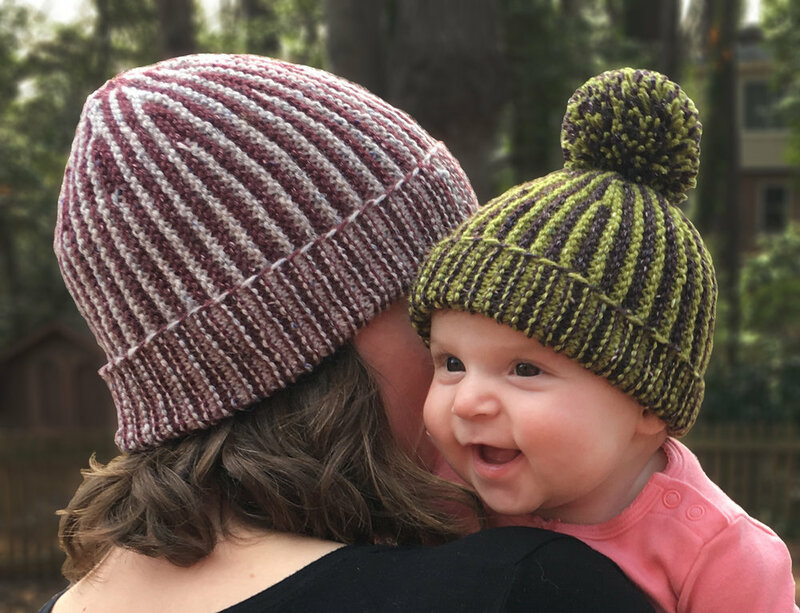 This pattern has 9 sizes ranging from Preemie to Adult X-Large. It also includes photo tutorials for provisional crochet cast on and grafting garter stitch. Available for purchase on Ravelry. Available on the Carolin FiberFest website. This cowl was designed for the Carolina FiberFest, 2018. It is meant to be light and airy to help keep the little chills of early spring away. The minimal patterning is perfect for those hand dyed skeins you fall in love with and want to use for something other than socks. My first published design on Ravelry, Horizontal Drops Scarf. This scarf is designed to be a summer scarf, light and airy. Using a yarn with linen will add to the summer feel. Since this scarf is cast on for the long edge, all of the drop stitches end up appearing horizontally across the scarf. At the same time the color change striping appears to run vertically through the scarf. The combination of vertical and horizontal details draws the eye and makes this scarf a great addition to any wardrobe.